Format Conversion believes in generating goodwill with clients and customers on the basis of work well done. Our simple yet meticulous approach has contributed to our success rate and made us stand out in our field of work. Over the past 10 years we have developed a proprietary process to convert your PDF files to AutoCAD (DWG) format in a way that ensures no loss of details and accuracy. 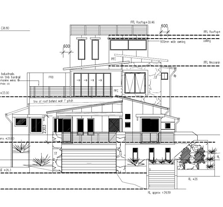 Our PDF to DWG conversions are editable and multi-layered. We follow AIA layering standards and can also accommodate your layering standards. The final drawing will be in DWG format and can include as many layers as you require. We can separate the text and place it in its own layer where it’s recognizable as text. We can also keep the dimensions in a separate layer. PDF format has been broadly recognized as an acceptable way to share information, particularly when the author does not want that information easily modified or when there is no longer a need to edit that information. PDF makes it easy to view on multiple platforms and provides a casual level of document security. But the PDF files cannot be easily edited, especially if you want to edit them layer by layer. Solution: our skilled experts can convert your PDF files to DWG format. You can fax, e-mail or send in your documents through CD’s or via FTP and we can convert them for you overnight.